Aim: This study was carried out to compare the efficacy of three irrigating needle designs in removal of debris from different parts of the root canal. Materials and Methods: Thirty human maxillary canines were prepared using HERO Shaper rotary system and irrigated with 1 ml of 5.25% sodium hypochlorite (NaOCl) after each instrument change. Three 25-gauge irrigation needle designs - brush-covered Navi Tip FX (Group I), side-vented needle RC Twents (Group II) and single-beveled (Group III) irrigating needles - were tested for their efficiency in debris removal in three different parts of the root canal (n=10 canals per group). Following instrumentation, the roots were vertically sectioned and divided into coronal, middle and apical thirds for observation under scanning electron microscope (×200 magnification). Debris on the canal wall was evaluated by using a four-scale scoring system described by Paque and his co-workers. Results: The canals irrigated with brush-covered needle Navi Tip FX (Group I) showed lower average debris score, indicating greater removal of debris in coronal third as compared to middle and apical thirds, whereas the canals irrigated with side-vented needle (Group II) and single-beveled needle (Group III) exhibited lower average score in the middle third than coronal and apical thirds. All the three needle designs exhibited higher debris score in apical third of the root canal. Tukey multiple comparisons test was applied at a significance level of P>0.05. A statistically significant difference (P<0.05) was observed in the debris removal in the coronal and middle thirds of root canals irrigated with brush-covered Navi Tip FX (Group I) and side-vented (Group II) needles, respectively, when compared with other needle design groups. Conclusion: Within the limitations of this study, it can be concluded that all the needle designs tested were effective in certain regions of the root canal with apical third uncleaned. Side-vented needle by creating turbulence removed debris effectively in coronal and middle thirds. Success of endodontic treatment is determined by removal of pulpal remnants, dentinal filings and microbes from the root canal system. 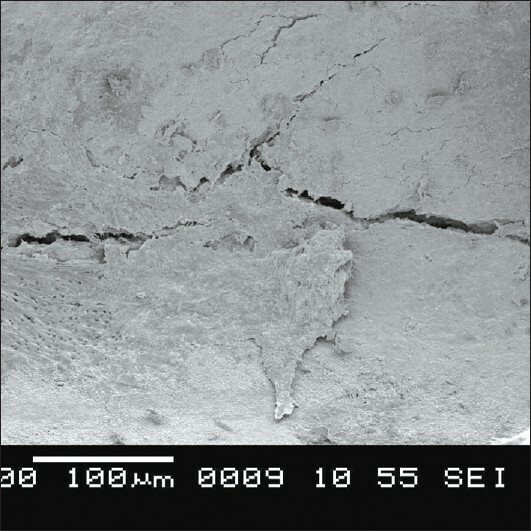 Current instrumentation techniques are ineffective in shaping all surfaces and irregularities within the canal system. Additionally, instrumentation produces a 1-5 mm thick smear layer that blocks the dentinal tubules from irrigant and sealer penetration. 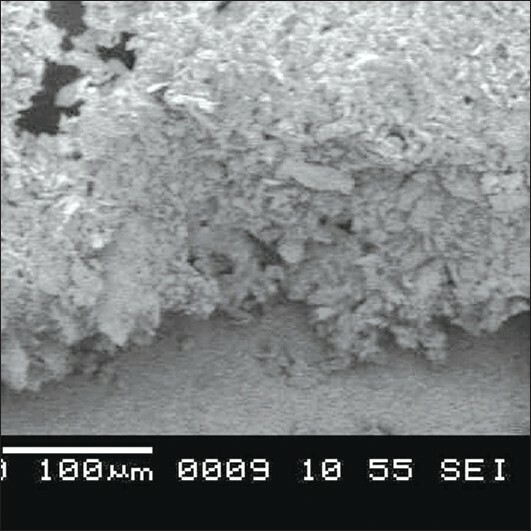 Tissue debris and smear layer that remain after mechanical instrumentation can harbor microorganisms and disrupt the seal between the material and canal wall, leading to treatment failure. Therefore, chemical debridement via use of irrigant is a necessary adjunct to mechanical instrumentation to remove organic and inorganic debris created during instrumentation. The aim of this study was to examine the canal debridement efficacy in different parts of instrumented root canal irrigated with brush-covered (Navi Tip FX), side-vented (RC Twents) and single-beveled needles. Thirty freshly extracted maxillary canines with completely formed apices were selected and stored in 0.9% saline solution. The teeth were radiographed in mesiodistal aspect to confirm canal patency, presence of single canal and complete root formation. Root canals with abnormal anatomy and calcifications were excluded. 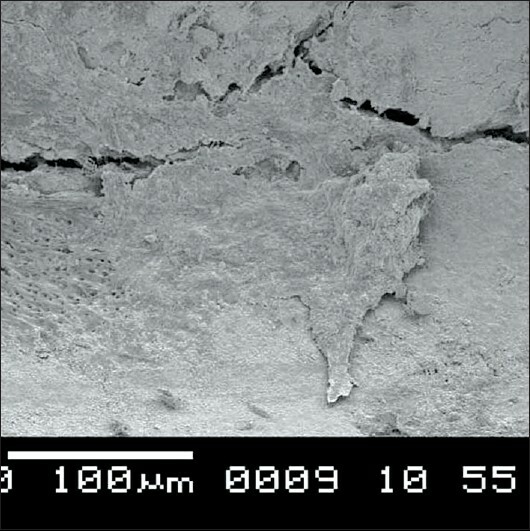 The teeth were decoronated to expose pulp chamber at a constant length of 16 mm from decoronated surface to root apex. The file was inserted into the canal until the tip just visible at the apical foramen, and from this length, 1 mm was subtracted to determine the actual working length. The teeth were then randomly divided into three groups of 10 teeth each. All teeth were instrumented with HERO shapers rotary nickle titanium system. Group I consisted of teeth irrigated with brush-covered needle (Navi Tip FX, Ultradent, south jordan, UT, USA). In Group II, the teeth were irrigated with side-vented needle (RC Twents, Prime Dental Products, Mumbai, India) and in Group III, the teeth were irrigated with single-beveled needle (Prime Dental Products, Mumbai, India). The 25-gauge needle size was selected for all the needle designs. The root canal was flooded with 5.25% NaOCl and replenished with 1 ml after each instrument change. The rubber stopper was placed on the needle and the needle was advanced into the root canal 3 mm short of the working length. After the coronal enlargement with Endoflare file (HERO shapers), initial glide path was achieved using K-files of size #15 and #20 to the working length. Canals were instrumented to size #30, with 0.04 taper first and then 0.06 taper using crown-down approach with HERO shaper nickel-titanium instruments (Micro-Mega, Besancon, France). Rotary files were used in controlled slow-speed, high-torque motor, with a speed of 250 rpm. After each instrument change, canal was flooded with 1 ml of 5.25% NaOCl using the needle type designated for each group. Irrigant was delivered at an average rate of 5 ml per root canal. At the end of instrumentation, each canal was flushed with 1 ml of 5.25% NaOCl. Immediately after completion of root canal preparations, the samples were coded to allow for blinded evaluation of the samples. The canals were dried with paper points. Teeth were carefully grooved vertically with carborundum disk on the buccal and lingual surfaces without penetrating the root canal. The teeth were then cleaned and dried before splitting them into two halves with chisel and mallet. The root canal half with the most visible part of apex was used for the evaluation under scanning electron microscope (SEM). Each half of tooth was divided into three equal parts designated as coronal, middle and apical thirds. 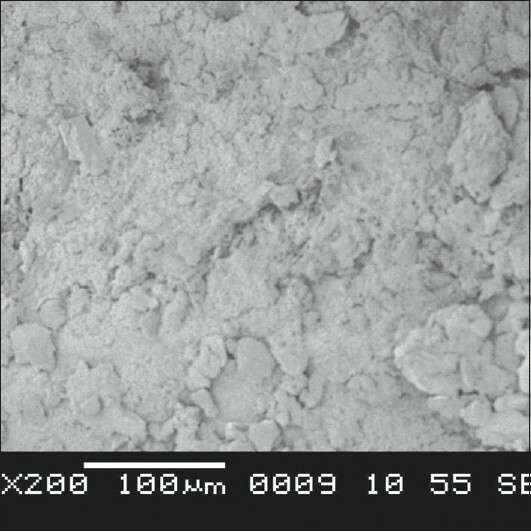 The samples were air-dried, sputter-coated with platinum using fine-coat ion sputter (Fine coat ion sputter JFC-1100, JEOL Ltd., Tokyo, Japan) and then observed under SEM with ×200 magnification. The area to be examined was standardized for each sample. 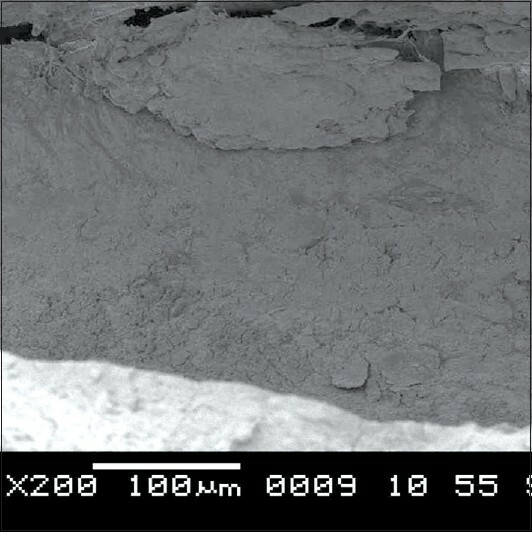 The central beam of the SEM was directed to the center of each third of the root canal by the SEM operator under ×30 magnifications, and then the magnification was increased to ×200 and the area of the canal wall captured on the screen of the SEM was used for scoring the sample. Score 1: Clean root canal, only few small debris particles. Score 2: Few small islets of debris covering less than 25% of the root canal wall. Score 3: Many accumulations of debris covering more than 25%, but less than 50% of the root canal wall. Score 4: More than 50% of the root canal wall covered by debris. Two calibrated and blinded evaluators independently scored the samples. The scores were then compared and if a difference was found, the two evaluators jointly examined the sample with a different score. If they could not reach an agreement, a third evaluator helped in scoring. The code was then broken and each sample was assigned to its experimental group. The results were statistically analyzed using the Tukey multiple comparisons test at a significance level P<0.05. To estimate intra-observer and inter-observer reproducibility, 20 micrographs were assessed three times in random order by two observers. The mean scores and their comparison in apical, middle, and coronal thirds of Groups I, II and III are shown in [Table 1]. The representative SEM images (Groups I, II and III) of coronal, middle and apical thirds are shown in respective micrographs [Figure 1],[Figure 2],[Figure 3],[Figure 4],[Figure 5],[Figure 6],[Figure 7],[Figure 8] and [Figure 9]. The canals irrigated with brush-covered needle Navi Tip FX (Group I) showed lower average debris score in coronal third [Figure 1] when compared to middle [Figure 2] and apical thirds [Figure 3], whereas the canals irrigated with side-vented needle (Group II) exhibited greater removal of debris with lower average score in the middle third [Figure 5] than coronal [Figure 4] and apical thirds [Figure 6]. 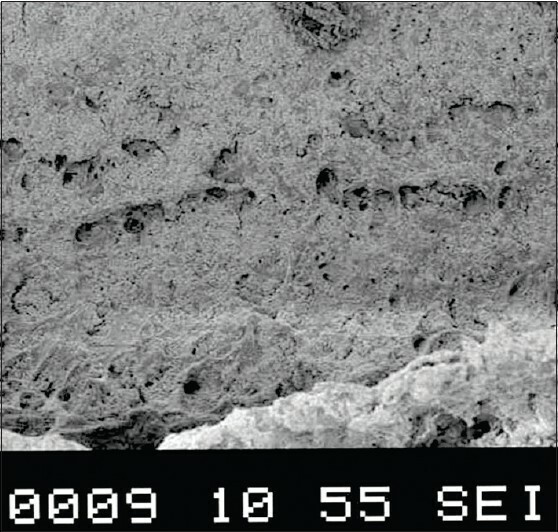 Root canals irrigated with single-beveled needle showed less removal of debris, with higher debris score in all the parts of root canal [Figure 7],[Figure 8] and [Figure 9]. All the three needle designs exhibited higher debris score in apical third of the root canal. The debris removal in the coronal third of root canals irrigated with brush-covered needle (Group I) showed a statistically significant difference (P<0.05) when compared with debris removal by side-vented and single-beveled needles, and no statistically significant difference (P>0.05) in debris removal was observed in coronal third when canals were irrigated with side-vented and single-beveled needle designs. However, the side-vented needle (Group II) showed statistically significant (P<0.05) removal of debris in middle third compared to brush-covered and single-beveled needles. The single-beveled needle (Group III) showed more debris score in all the three parts of root canal compared to Groups I and II, indicating its inadequacy in removal of debris. The difference in debris removal from apical third when compared between the groups was not statistically significant (P>0.05) as evident in Tukey multiple comparison test. One of the most important objectives during root canal instrumentation is the removal of pulp tissue, elimination of microorganisms and their toxins from the root canal system. The ability to achieve this objective was evaluated in the present study by root canal irrigation using brush-covered, side-vented and single-beveled needles. The results obtained in this study might have been improved if the brush-covered needle was mechanically activated in an active scrubbing action during the irrigation process to increase the efficiency of the brush. Furthermore, studies should be motivated to address debridement efficacy of irrigant in apical third of root canal by varying the depth of insertion of the needle and taper within the root canal. Within the limitations of this study, all the needle designs tested left the debris on the canal wall. The brush-covered needle was effective in coronal third, while side-vented needle in the middle third and single-beveled needle failed to remove debris from any part of root canal. 1. Albrecht LJ, Baumgartner JC, Marshall JG. Evaluation of apical debris removal using various sizes and tapers of Profile GT files. J Endod 2004;30:425-8. 2. Baumgartner JC, Mader CL. A scanning electron microscopic evaluation of four root canal irrigation regimens. J Endod 1987;13:147-57. 3. Darke DR, Wiemann AH, Rivera EM, Walton RE. 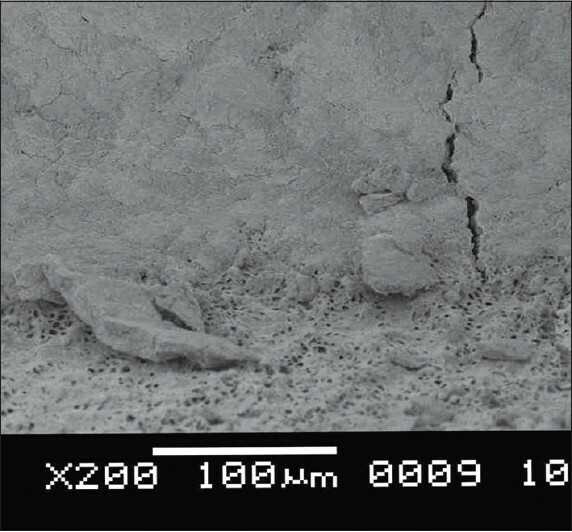 Bacterial retention in canal walls in vitro: Effect of smear layer. J Endod 1994;20:78-82. 4. Dunavant TR, Regan JD, Glickman GN, Solmon ES. 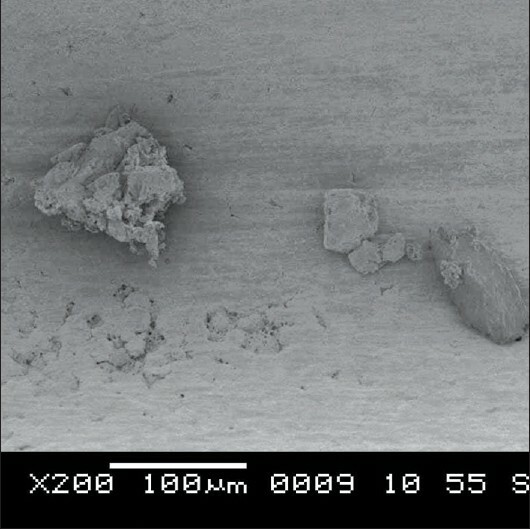 Comparative evaluation of endodontic irrigants against enterococcus fecalis biofilms. J Endod 2006;32:527-31. 5. Chow TW. Mechanical effectiveness of root canal irrigation. J Endod 1983;9:475-9. 6. Boutsiokis C, Lamrianidis T, Krstrinakis E. Irrigant flow with in a prepared root canal using various flow rates: A computational fluid dynamics study. Int Endod J 2009;42:144-55. 7. Benjamin A. Nielsen. Comparison of the endovac system to needle irrigation of root canals. J Endod 2007;33:1-5. 8. Al-Hadlaq SM, Al-Turaiki SA, Sulami UA, Saad AY. 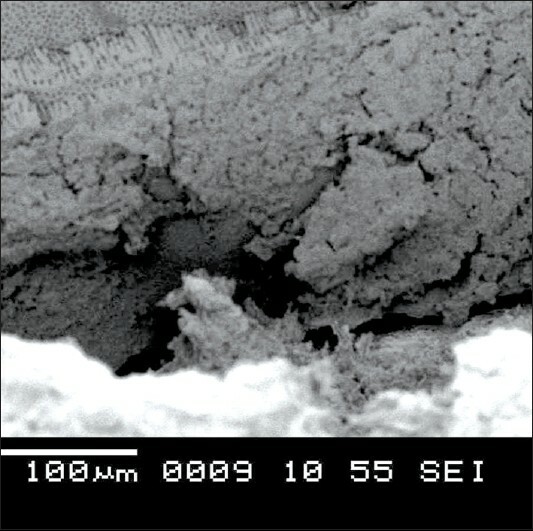 Efficacy of a new brush-covered irrigation needle in removing root canal debris: A Scanning Electron Microscopic Study. J Endod 2006;32:1184-7. 9. Frederick H, Rosenberg P, Gliksberg J. An in vitro evaluation of the irrigating characteristics of ultrasonic and subsonic hand pieces and irrigating needles and probes. J Endod 1995;21:277-80. 10. Keir DM, Senia ES, Montgomery S. Effectiveness of a brush in removing post instrumentation canal debris. J Endod 1990;16:323-6. 11. Paque F, Musch U, Hulsmann M. Comparison of root canal preparation using RaCe and ProTaper rotary Ni-Ti instruments. Int Endod J 2005;38:8-16. 12. Abou-Rass M, Piccinino MV. The effectiveness of four clinical irrigation methods on the removal of root canal debris. Oral Surg Oral Med Oral Pathol 1982;54:323-8. 13. Salman MI, Baumann MA, Hellmich M, Roggendorf MJ, Termaat S. SEM evaluation of root canal debridement with sonicare canal brush irrigation. Int Endod J 2010;43:363-9. 14. Chirs S, Baumgartner JC. Comparison of debridement efficacy of Endovac Irrigation system and conventional needle root canal irrigation in vivo. J Endod 2010;36:1782-5. 15. Hsieh YD, Gau CH, Kung Wu SF, Shen EC. Dynamic recording of irrigating fluid distribution in Root canals using thermal image analysis. Int Endod J 2007;40:11-7. Yoshino, A. and Tabuchi, M. and Uo, M. and Tatsumi, H. and Hideshima, K. and Kondo, S. and Sekine, J.